Today, I’ve got a Norwegian classic for you. Tarjei Vesaas (1897-1970) came from the village of Vinje, a village in the southern Norwegian province of Telemark. He was a prolific writer, publishing over 25 novels, including 1963’s The Ice Palace. I’m reviewing the new Penguin Modern Classics edition, which has been published in association with Peter Owen Publishers. Before I start on the novel itself, I must say that I think the cover image is gorgeous. 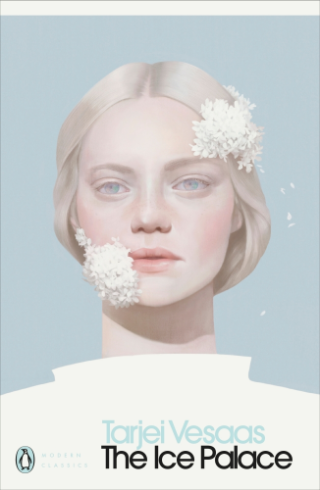 It’s by Hsiao-Ron Cheng, a Taiwanese artist; if you like this picture, there’s more on her Instagram. Now, back to The Ice Palace. It’s the story of two 11-year-old girls, Siss and Unn. Siss is the leader in her school playground, the one whom all the other children gravitate towards. Unn is a recent arrival from another district, come to stay with her aunt (rumour has it, because she has been orphaned). Unn stands apart from all the others in the playground, but Siss is drawn to her nonetheless. It turns out that Unn would like to spend time with Siss after all, but will only do so if Siss visits her at home after school. Siss accepts the invitation. Four eyes full of gleams and radiance beneath their lashes, filling the looking-glass. Questions shooting out and then hiding again. I don’t know: Gleams and radiance, gleaming from you to me, and from me to you alone – into the mirror and out again, and never an answer about what this is, never an explanation. In that moment, a unique spark of something has ignited between Siss and Unn; the whole sequence is full of the raw sense of two children working out the shape of their new friendship in the moment. As the scene progresses, it appears that Unn would like to disclose a deep secret to Siss, something that she hasn’t felt able to say to anyone else. However, just as Unn begins to do so, Siss feels uncomfortable and asks to leave. The following morning, Unn (in the only chapter written from her viewpoint) feels that it would be too embarrassing to meet Siss again that day. Instead of going to school, Unn decides to explore the ice palace, a mysterious and beautiful structure which has been formed by a frozen waterfall. It’s there that Unn vanishes. The rest of the novel revolves primarily around Siss, and her response to a world without Unn. At first, Siss promises to think about Unn – and no one else – for as long as Unn is missing. However, that leaves Siss the isolated one in the playground. She needs to find a different way to be. In this aspect, The Ice Palace is a coming-of-age story. There is something secret here. [The men] bring out what sorrows they may have and transfer them to this midnight play of light and suspicion of death. It makes things better, and through it they fool themselves into enchantment. They are dispersed in the angles of ice, the lanterns shoot transverse gleams, meeting the lights from other cracks and prisms – quite new beams are illuminated, just as quickly extinguished again for good. The prose, in Elizabeth Rokkan’s translation, is a mixture of flowing sentences and jagged fragments. It helps turn what might seem on the surface to be a fairly straightforward novel into a sharper reading experience that stays long in the mind. The Ice Palace (1963) by Tarjei Vesaas, tr. Elizabeth Rokkan (1993); original pub. Peter Owen, this edition Penguin Modern Classics; 140 pages; paperback (review copy). Last year I read Vesaas’ The Boat in the Evening which I was less than impressed with (though it is a later book, and autobiographical). Of course, I should have read his most famous book first as now I am a little wary! I have seen the film – many years ago (I doubt they would show it now). I would definitely recommend giving this a go, Grant. I didn’t know there was a film, though – why do you think they wouldn’t show it now?